3 Tips to Make You Richer. I am a total believer that what you think you become. You can create your destiny. You can attract what you want to your life. With attraction you need to have action. Here are three tips to a follow in your life that will help you succeed. We need to look at where we want to be with our finances and set a plan. When is retirement? What is the plan going to cost? What do I want to have, give, do? Again, it is one thing to think rich but we need to create actions. Put so much aside for savings. Think about those little things we spend money on. Set a budget and plan of action. See an adviser if you need help. Understanding your finances is so important. Plan for today and plan for tomorrow. I look at my finances every month to see where I am and if I am on track to my goals. I also keep a journal to attract what I desire in life. Both work in conjunction for me. It's pretty exciting and doable. Attraction & Action. Really, it is as simple as that!!! Now there are so many ways to make money and at a low cost to earn. You need to research what is available and what you want to do. You need to look for areas of your work and take the initiative. Inform those involved you are ready for the challenge. You need to look at a side business to earn more. I know it sounds too simple but that is what it is. Now when I say it is easy I am not saying you sit on the couch and money bags are dropping on your seat. There is action and effort that needs to be taken like anything in life. My point is take the action now and see where you can earn more income. For me, I have my own business that gives me the opportunity to act smart and earn where I want helping others build their incomes. 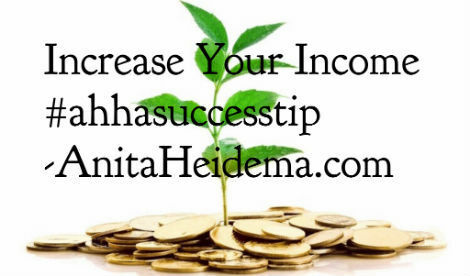 I have added where I need to and have a diversified portfolio to work from and get residual income from. Win Win on my terms. We tend to waste time on unproductive activities. Take note of what you spend your time on during the day. Add activities and positive habits to your life. I always talk about how it takes 21 Days to build habits so make them positive and not negative ones. Manage your time wisely. Once it is gone you can't get that time back. All in all you are what you think and do. If you think something is impossible it is. As children we thought everything was possible. Bring that inner child back again.